Archaeologists have unearthed an ancient city in the Cambodian jungle. Step aside, Indiana Jones. On Saturday, the Sydney Morning Herald published an exclusive report revealing that archaeologists have uncovered a lost mediaeval city in the jungles of Cambodia, which predates Angkor Wat by 350 years. A reporter and photographer from Fairfax Media recorded the early stages of the discovery, which was an ordeal in itself. Following the lead of their intrepid one-legged guide Heng Heap, the expedition hacked their way through landmine-infested jungle and waded through rivers and bogs, before finally reaching the mediaeval Khmer city of Mahendraparvata. Mahendraparvata was the seat of the civilization that founded the illustrious Hindu-Buddhist Khmer Empire that stood at the center of Southeast Asian life for around 600 years (802-1431 AD), before mysteriously fading from history and leaving its magnificent monuments to ponder. Ancient Khmer scriptures speak of a warrior named Jayavarman II who lived in an elusive mountain capital. Mahendraparvata appears to be that capital. Until now, the mediaeval city had remained buried by thick jungle brush in the Phnom Kulen mountains only 25 miles north of the wondrous Angkor complex, the largest religious monument ever built. The UNESCO World Heritage site attracts 2 million visitors annually and was considered one of the wonders of the ancient world. Aerial eye candy of Angkor Wat can be seen here. While whip-cracking Indy must rely on his wits, musty maps and a lot of blind luck, the archaeologists who mapped and uncovered Mahendraparvata were a little more high tech. Led by Dr. Damian Evans, director of the University of Sydney's research center in Cambodia, and Jean-Baptiste Chevance of the Archaeology and Development Foundation in London; the team used airborne laser technology called Lidar (light detection and ranging data) – billions of laser pulses beamed down from a helicopter – to collect data points. They had a match. Their findings from the air aligned with the specs jotted down by surveys previously conducted on the ground. Further, they were able to link what before seemed like scattered ruins into a coherent picture that evaded them after years of research on the ground. In so doing, the team pinpointed the contours of the city that once brimmed with life. Among the landmarks and structures found at Mahendraparvata are more than two dozen temples, as well as the remains of ancient canals, dykes and roads. The team’s exploration and mapping expert, Stephane De Greef, has pinpointed the locations of almost 30 previously unknown temples so far. Amazingly, the site appears to have evaded looters until now. Indeed, local residents have expressed amazement at the discovery of the city, of which even they were unaware. This is not the first time surprise discoveries have been made in the region. 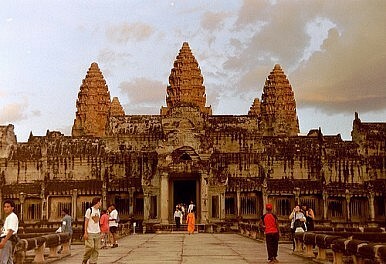 Cambodia seems to be chock-full of physical traces of its heritage waiting to be discovered. Last August, a group of bathing children uncovered six Buddhist statues believed to be around 1,000 years old around 50 miles north of Phnom Penh. "We need to preserve the area because it's the origin of our culture," Chuch Phoeun, secretary of state at Cambodia's Ministry of Culture, told AFP. The initial survey only marks the beginning of exploring the site, according to Evans who said the size of the site remains unknown. "Maybe what we see was not the central part of the city, so there is a lot of work to be done to discover the extent of this civilization," he said. The results of the discovery will be published in the Proceedings of the National Academy of Sciences in the United States. Now that this network and city grid have been discovered the real work can begin: of understanding what made the Angkor Empire rise, tick and fall away, mysteriously abandoning its majestic stone megaliths in the Cambodian jungle centuries ago. In other words, did the Khmer empire become so successful that its leaders could no longer manage their own creation? While we await the answer to this question, the discovery of the site is refreshing not only for its historical significance, but also for its implications for the Cambodian economy. It will undoubtedly draw even more visitors to the area, which already attracts some 2 million annually. But perhaps most exciting of all, Mahendraparvata reminds us that there are still discoveries that may yet be made. The future of archaeology is high-tech. One of its first laboratories is the jungles of Cambodia.